What/who were the intended audience? What might it tell us about attitudes and values – that is, those things that people believe and the right way to behave? What does it tell us about how people lived at the time? Why do you think the object/artebact is held in a museum? At this time only men were conscripted. Suggest why. Do you think it would be different today. Why did Hughes hold referendums on the issue of ‘conscription’? Identify arguments presented for and against conscription at the time. Do you think these arguments would be presented today if a referendum on ‘conscription’ was to be held? What was the outcome of the referendums on conscription? 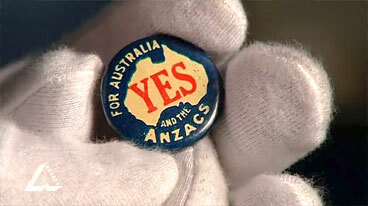 What effect did the referendums on ‘conscription’ have on the Australian community at the time? Write a 100 word caption to accompany the display of the1916 Conscription Badge in a museum. Include in the caption a description of the icon and its relationship to the twentieth century Australian history.